The State of Alaska is blessed with one of the finest public harbors systems in the country. Our magnificent coastline and bountiful marine resources make our harbors vitally important to Alaskans and our communities. To provide financial assistance to municipal or regional housing authority owned harbor facilities, the Alaska Legislature passed landmark legislation in 2006 establishing a new 50/50 matching grant program called the Harbor Facility Grant Program. This grant program will go a long way towards recapitalizing local government’s harbor infrastructure and furthering the sustainability of Alaska’s public harbor system. This grant program is funded on an annual basis at the discretion of the Alaska Legislature and consists of two tiers, Tier I and II. The first tier has priority and consists of major maintenance and repair of a harbor facility that was previously owned by the state and now is locally owned. 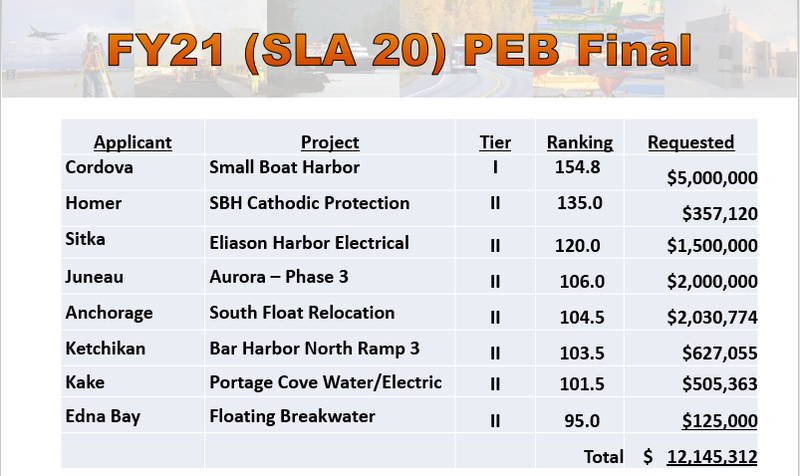 The second tier consists of all other harbor facilities and those harbor facilities which have already received a Tier I grant. A harbor facility may only receive one Tier I grant but is eligible for multiple Tier II grants..
For more information, contact the Statewide Program Development, Juneau Field Office at (907) 465-8864.